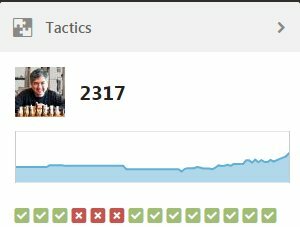 Recently, I broke the 2300 mark on Chess.com's Tactics Trainer. Although building up your tactics skill is a road of consistent effort and learning, I was able to attribute my recent performance on the tactics server to a few specific changes in the way I train. In this article, I will summarize six of those changes in the form of specific tips. For those of you who enjoy watching videos, I created a video on this topic. I found that I was doing my tactics training in places where I could get easily distracted. For example, on my phone while the kids were getting ready for school or during dinner with the family. One of the major things I changed was to follow a simple rule: No tactics when someone else is in the room. It reduced my distractions, and improve my relationships with my family members. As I started to improve at tactics, I found myself focusing too much on my tactics rating. I know the title of this article is focuses on my rating, but it was my focus on the process of training and improvement that produced the results, not the other way around. Besides focusing on the process more, I also tried to monitor the way I spoke to myself. 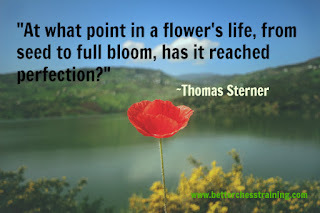 Instead of getting upset when I got a problem wrong, I would tell myself, "I am learning and growing from this mistake" or something similar to try to put myself in a better frame of mind. An important factor in improving my tactics was having a command of various tactical themes. To this end, I supplemented my training on Chess.com with several chess tactics e-books on Chessable.com: 1001 Chess Exercises for Beginners and The Woodpecker Method. As of this writing, I've solved about 1000 problems (and reviewed them multiple times with Chessable) covering a comprehensive variety of tactical motifs in these books. This foundation served me well as I was able to spot patterns fairly quickly. Since Chess.com's rating is partly derived from the speed in which you solve the problems, this fluency with the tactical patterns paid dividends in terms of higher ratings gains from correct solutions. Another important habit that I developed over the last year is looking over all of the problems particularly the ones I got wrong to make sure I understood the solution. In addition to understanding the chess aspects of the problems, I also analyzed my thoughts and variations I had when solving the problems. This self-awareness helped me to avoid future mistakes. On Chess.com, I downloaded the problems and studied them on SCID. If I found a useful pattern, I saved it into Chessable. This has helped me to identify similar patterns in future problems. I read about people who do 50+ tactical problems a day. However, I wonder how they do these? Are they studying their mistakes? Are they treating these problems like a game-like situation? I think players need to balance quantity and quality when it comes to tactics training. I probably do about 10-15 new tactics problems daily. I do review tactics problems using Chessable, so this probably accounts for another 10-20 problems daily. Additionally, among these problems, I probably do additional analysis on a few of the problems - e.g. if I get a problem wrong - to make sure I understand them. This takes about 20-30 minutes a day. I think this thoughtful training is just as effective as someone who plows through a ton of problems over a full hour. Of course, everyone's different, but reflect and observe your own habits and see if you are balancing quality with quantity. How do you see yourself as a tactician? Thinking of yourself as "the best tactician in the world" may be unrealistic and is probably more detrimental than helpful. However, if you see yourself as a capable tactician or an improving tactician, that identity can help influence your behaviors. If you identify yourself as a good tactician, you'll be more thoughtful in your training. You'll be more confident both in your training and your games when it comes to tactics. This may sound a little farfetched, but I started tell myself that I was a good tactician. I started to take pride in seeing all of the relevant variations in a problem. I started to see more combinations and sound sacrifices in games. Try it out! Of course, your tactics rating is separate than your overall chess strength and rating. However, for many amateur players, a deficiency in tactics is a big hindrance. I've met many players who "outplayed" me only to drop a piece and then had to resign - and I've been that player as well. If you look at the tactics ratings of title players like International Masters, you'll see they all have incredibly high tactics ratings. Indeed, not all players with high tactics ratings are strong players overall...but nearly all strong players have high tactics ratings. I invite you to try a few of these tips in your future training. Send me a tweet at @YourBryanCastro and let me know what you thought about this article. Copyright 2014-2018 Bryan Castro. Simple theme. Powered by Blogger.